Main Hall Total size 12m x 30m. Standing capacity 500; seats available for up to 350. The hall has a moveable wall capable of screening off the rear third of the hall as a separate bar. Maximum standing capacity for hall with moveable wall closed is 400. Maximum standing capacity for Bar is 186. The hall can seat 200 at dining tables, the bar can accommodate 72 at cafe tables. Reynolds Room - A smaller functions room 7.5m x 10m. Maximum standing capacity 65 or 40 seated at cafe tables. Dressing room/ classroom 7.5m x 6m and can be halved using screening. The economical solution for small meetings of around 12 people and has wheelchair access. 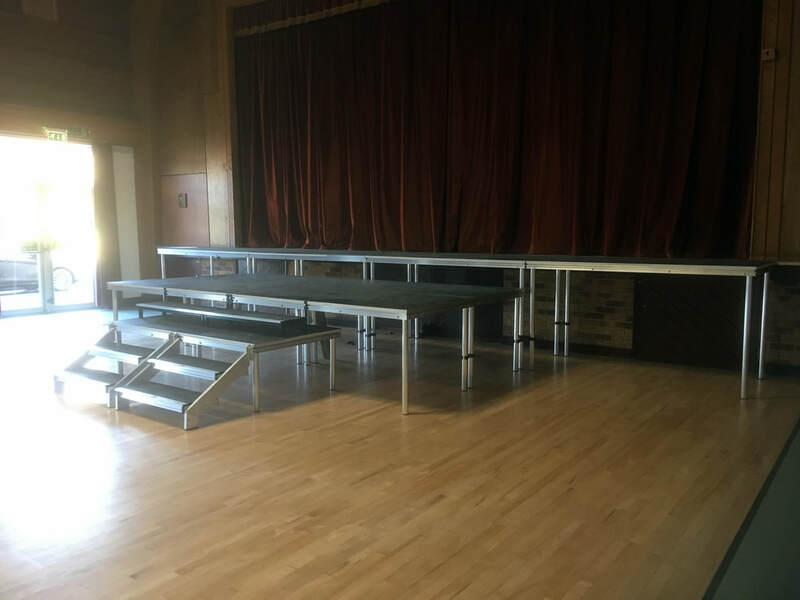 The stage has a 63amp 3 phase socket for PA/lights, as well as stage lighting and PA. We also have a portable PA system for use in other rooms, plus projector and screen. ​Seating: we now, as of May 2018, have 100 new banquet chairs to add to our 180 older banquet chairs. We also have 50 bistro style chairs. There is a well appointed kitchen, which has been used for cookery classes, and crockery, cutlery and glasses for 200 guests. Seats and tables can accommodate that number also. Wheelchair users will find they have easy access to the main hall, Reynolds Room, bar and kitchen and there are disabled toilets adjacent to the Reynolds Room and off the foyer. A wheelchair ramp also gives separate access to the stage and dressing room. The Centre has free parking space for approximately 10 vehicles and adjoins a paying long-stay car park with space for approximately 150 vehicles. The centre's bar, showing the moveable wall half open to show the main hall beyond. Part of the centre's temporary staging set up to extend the main stage. The dressing room, when not being used for that purpose, is ideal as a small committee meeting room. The Reynolds Room, our smaller functions room, opens onto a small garden and has toilets immediately adjacent. The hall set up for a wedding reception. As a charity, the Centre does not employ full-time staff. 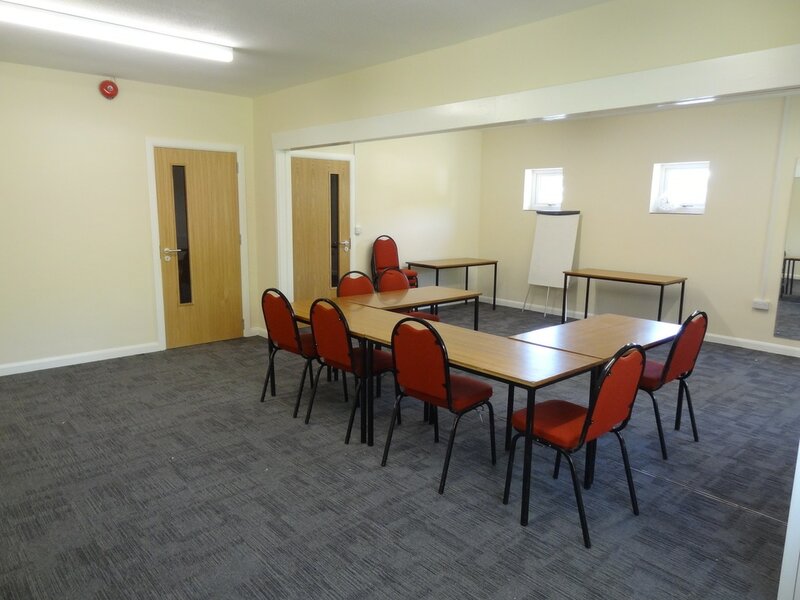 It offers hirers the basics at a very affordable price, with all its rooms available for hire separately and cheaper rates available for community or non-commercial activities. 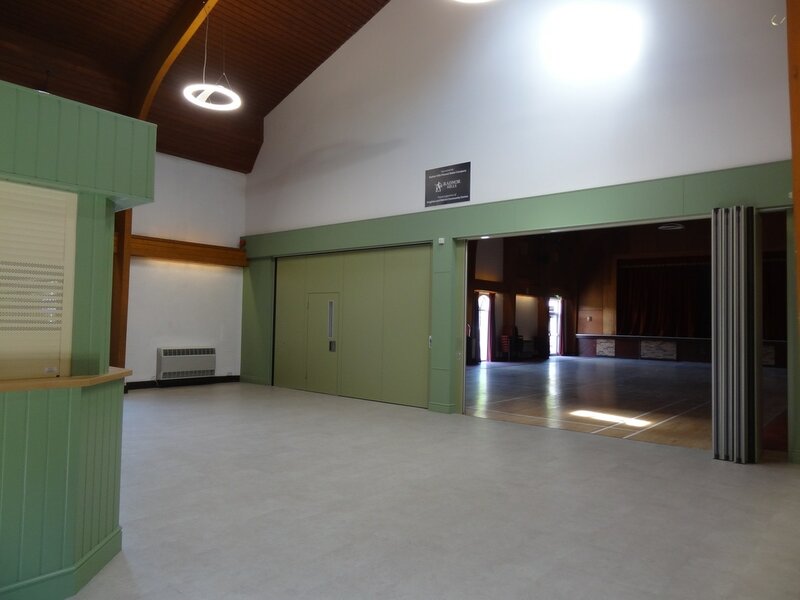 The main hall can be hired for as little as £30 per 2 hour session, the Reynolds Room or bar for £25 per 2 hours, or the dressing room for £15 for 2 hours. Your function can include a staffed bar for an additional £50 (the bar operating for the profit of the centre). Use of the kitchen for preparing drinks and light snacks is allowed at no extra charge, while a charge of £25 per 2 hours is made if the kitchen is to be used for cooking a full meal. The whole Centre may be hired for a weekend for wedding parties at a very reasonable rate. Sorry but all alcohol consumed on the premises must be purchased through the centre's bar - but then our suppliers can furnish whatever is needed. Please phone 07751221487, email knightoncomm@googlemail.com, or use the contact form on this website for a quote or to discuss availability and any particular requirements you may have. Community Centre left of picture, with its ample parking. The town centre is to the centre and right of the picture. Available for download below are policies adopted by the Centre's Management Committee.